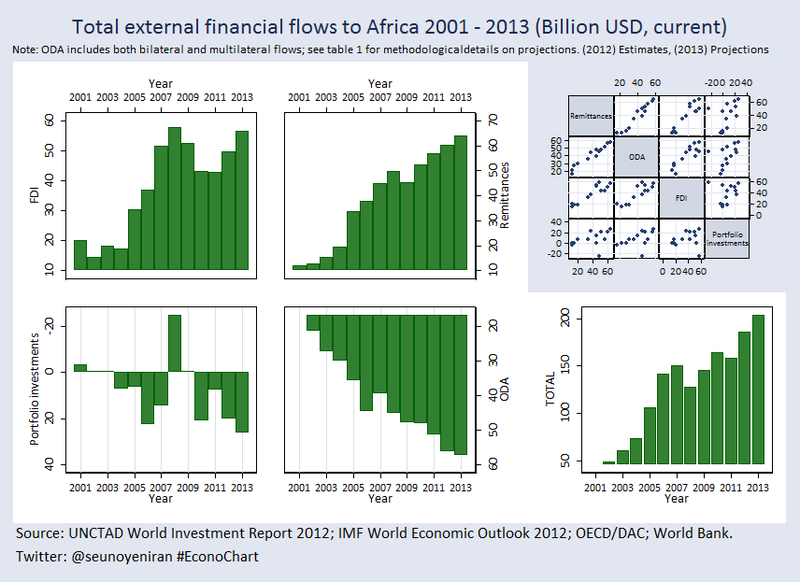 In 2012, for the first time, remittances became the largest external financial source to Africa, ahead of Foreign Direct Investment (FDI) and Other Development Assistance (ODA). According to African Economic Outlook, (2013) more than 30million Africans (about 3% of its population) are living outside of their home country, remitting 11% of global remittances in 2012, compared to 8% in 2001. Nigeria receives between 30% and 60% of remittance in the African region(Orozco, 2003).The World Bank (2012) reported that the top recipients of officially recorded remittances for 2012 are India($70 billion), China ($66 billion), the Philippines and Mexico ($24 billion each), and Nigeria ($21 billion). Remittances are mostly sent to Africa through informal channels; hand carried during visits to home countries and households, sent through transport companies or delivered through other informal channels largely due to limited access to and the high cost of formal financial (banking) services relative to average per capita incomes in African countries (Pendleton and others 2006; Bracking and Sachikonye 2008; Tevera and Chikanda 2009). According to International Fund for Agricultural Development (IFAD, 2009) large share of remittances from outside Africa is channeled through a few large international money transfer agencies, who in sole partnership with African banks and post offices. Irving,Mohapatra, and Ratha (2010) found that almost 70% of central banks in Sub-Saharan Africa cited high costs as the most important factor inhibiting the use of formal remittance channels. Innovative options such as mobile money transfer are getting popular but adoption of these has been limited mostly to domestic money transfers, largely because of concerns about money laundering and terrorist financing. These technologies have the potential to vastly improve access to both remittances and broader financial services, including low-cost savings and credit products, for African migrants and remittance recipients. Remittance receiving households in Africa usually save remittance money in some type of financial institution rather than put it under the mattress. These steady stream of remittances receipt can be used as a factor in evaluating the credit worthiness of recipients for microloans, consumer loans, and small business loans (for example, to purchase agricultural equipment [Ratha, 2007]). Not only has a number of research found that bulk of remittances are used for consumption or investment in human capital (education, health, better nutrition), data from a multiple surveys and story-telling evidences indicate remittance has been found to provide initial capital to starting a business thereby stimulating entrepreneurship (De Haan et al., 2000;De Haan, 2000 Dermendzhieva, 2011; Cortes, 2007). Identifying these poverty-eradicating and sustainable development potentials of remittance, World Bank recently initiated a global Knowledge Partnership on Migration and Development (KNOMAD), which is aimed at facilitating multidisciplinary debate and discussion on migration issues, developing policy options, and assisting sending and receiving countries implement pilot policies. While KNOMAD is on one hand, there is growing debate on how to use remittance in sustaning development in Africa through financial market linkages examples are the diaspora bond, collateral securitization, among others. So what are your experiences with remittance as an African in diaspora? Do you feel the cost of sending money to Africa is too high? What are your suggestions on making remittance work for sustainable development in Africa? Do you have anything to share with our team on remittance in Africa in General? use the hashtag #econochart to sustain the conversation.